The Texas Instruments BQ27500 01 system-side Li-Ion Battery Fuel Gauge is a Microcontroller peripheral that provides fuel gauging for single-cell Li-Ion battery packs. The device requires little system Microcontroller firmware development. The BQ27500 01 resides on the system main board, and manages an embedded battery (non-removable) or a removable battery pack. The BQ27500 01 uses the patented Impedance Track? algorithm for fuel gauging, and provides information such as remaining battery capacity (mAh), state-of-charge (%), run-time to empty (min. ), battery voltage (mV), and temperature (C). Battery fuel gauging with the BQ27500 requires only PACK+ (P+), PACK? (P? ), and Thermistor (T) connections to a removable battery pack or embedded battery. The bq27501 works with identification resistors in battery packs to gauge batteries of different fundamental chemistries and/or significantly different rated capacities. 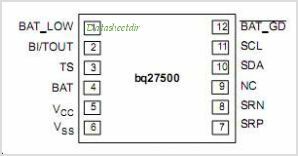 This is one package pinout of BQ27500,If you need more pinouts please download BQ27500's pdf datasheet. This is one application circuit of BQ27500,If you need more circuits,please download BQ27500's pdf datasheet.